• You need to test your market to know if buying a C-arm will be a good investment for you. • Your current C-arm is down for repair and you don't expect it back up anytime soon. • You are running a training/continuing education course and need C-arms to demonstrate procedures. • You are working to pare down a backlog of patients. • You have money in the operating budget, but not so much in the capital budget. Whatever the reason, consider the following costs to make your C-arm rental work for you. Ready to request a rental? Click here to let us know what you need. As a general rule: the shorter the term, the higher the cost. This is because, regardless of the length of term, the same amount of work goes into arranging logistics (setup, shipping, testing, etc.). With a shorter term, these logistical costs are not spread out over time. Here are average ballpark prices for a few different rental terms. • Yearly Rental - similar to the monthly rental, but at a discount. The longer the term, the deeper the discount. Keep in mind that C-arm rentals are designed to meet a specific need like the ones listed above. If you need a long term solution, we strongly recommend you consider a C-arm lease or an outright purchase. • Accessories - lead vests, injectors, or C-arm tables can all be rented at an additional cost. • Security deposit - this is refundable if the unit returns in the same condition it was provided. • Transportation - these fees cover delivery and, if you need your rental quickly, expediting. • Installation - this covers an engineer to set up the C-arm and collect it at the end of the rental term. Make certain when comparing quotes to observe these add-on fees. Depending on the length of term, the fees will often be embedded into the monthly rental fee, but the quote should always note if these are additional or included. 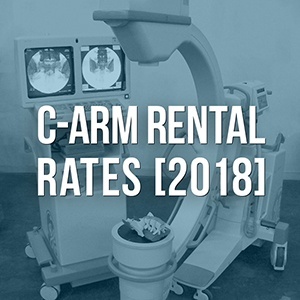 If you would like more information and are ready to move forward with your C-arm rental request, please use our easy C-Arm Rental Request Form. We look forward to helping with your next rental solution very soon!